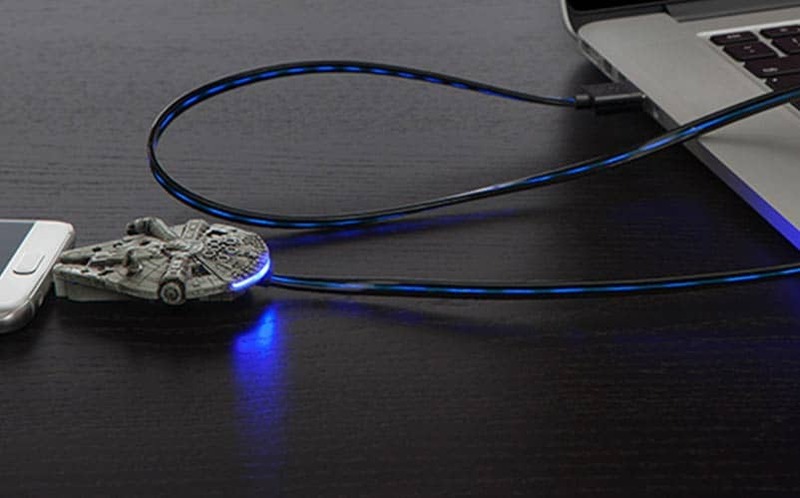 Illuminated Millennium Falcon Micro-USB Charging Cable | Nerd Much? You wouldn’t think you’d be able to recharge your devices with the most famous hunk of junk in the galaxy. But now, thanks to ThinkGeek, you can do just that with this Millennium Falcon Micro-USB Charging Cable. This Star Wars-themed cable has a 34″ cord that’s not only long, but it’s also illuminated with blue lights that animate when your device is charging, as if you’re getting all of the Millennium Falcon’s power to juice your phone. It’s a pretty cool effect, and it looks especially great in a dark room. The Millennium Falcon charging cable also has illumination from the Falcon itself, with a blue light glowing out of it while you’re charging. You’ll also know when your device is completely charged, as the animation on the cable will stop. The front of the Falcon has the male micro-USB end. The new cable uses USB 2.0, and you can use it to both charge your phone and transfer files to and from your PC. It’s another great way to inject some unnecessary nerdiness into your daily routine, and we’re all about that here. Buy the Millennium Falcon Micro-USB Charging Cable here. For more nerdy stuff, check back daily. We also feature a hefty portion of cool Star Wars gifts, too. You can also follow us on Twitter for timely updates.